This is my personal recollection of an enjoyable weekend, so don't expect much detail of the programme items, especially as I'm writing a few weeks after the event! Weston-super-Mare this year, for my 4th CULT TV (note - not a Convention, a TV appreciation weekend), but the first one that I'd been to with a group of friends. Last year I'd found the courage to wear my home-made B7 costume (Avon's silver tunic) around the hotel and then enter the Fancy Dress competition; this year I was to go even further! And the person responsible for that is "Londo Mollari" aka Lesley Rhodes, founder of the "Couro Prido", a small, unofficial Babylon 5 fan group dedicated to spreading joy and appreciation of Centauri culture (and alcohol) to the human race. The rest of the group are; "Lord Refa"- Jon Crew; our ally "Xena, warrior Princess"- Becky Duty; "Vir Cotto / Lady Timov" (what an odd mixture) - that's me, Anne Wells! For this weekend we were joined by a Klingon-Centauri hybrid, Steve Rogerson. Also present were our esteemed associates from Blake's 7 fandom, Judith Proctor, Val Westall and Linda Norman. Steve arrived before us and had secured a suitable Dealers Room table for Judith, her zines and "REDEMPTION '01". He'd also found out where the bar was - that man was born to be a Centauri! While we were waiting for the chalet-registration to open, Lesley found the crazy-golf course and suggested a Centauri v. Klingon game, with her and Steve in full costume; alas, it was not to be - rain stopped play! After unpacking in our "palatial" chalets, we donned costumes so that Ambassador Londo Mollari could make her first appearance at dinner, supported by the rest of the Couro Prido. This meant that I stepped into my role "official hairdresser", as Jon needed assistance in arranging his long hair into a Centauri crest (a wire frame, lots of hairgrips and extra-hold hairspray). Becky had volunteered to be Vir Cotto this weekend, so that meant an attempt to roll her waist-length hair into a crest - more ozone-layer busting hairspray! After all this, I finally found time to study the video-room timetable and discovered that I'd missed hours of Paul Darrow (oh ducat! - an expletive borrowed from a B5 blooper reel). Oh well, I'd be seeing the man himself on Saturday. With the Couro Prido suitably attired we went to dinner - I hope the sight of two very convincing Centauri lords and their aides accompanied by a Klingon warrior (Steve) didn't make too many people choke on their food. There was to be a "Famous for 5 Minutes" (later referred to as F-5m) item this year instead of "Fancy Dress"; Lesley had volunteered us for this, but it wasn't until Friday night that she and Judith got together to draft out ideas for our "sketch". Safe with the knowledge that I'd just be an extra without a speaking part, I enjoyed the "60's" disco. Where was all the great music of my childhood?? - the DJ played at least TWO golden oldies (whinge, moan). The old lady (me) and the teenager (Becky) gave up around 1am - Lesley and Steve lasted until the end (true to their races, Centauri and Klingon). I finally made it to my usual hang-out, the Dealers Room, and found that there were only 2 tables that interested me - Judith's (our table), and HORIZON's. While I was rummaging through the Horizon wares, I was told that I'd won their "Guards! Guards!" raffle - Yippee!! With a huge daft grin on my face, I bounced back to our table to share my good news with Judith, Val, Linda and Lesley. The next item on the schedule was the one interview of the weekend that I HAD to see - Paul Darrow; I wore my silver tunic in homage to the "Lord Avon" (a year ago I wouldn't have dared to - how people change!). I honestly can't remember what he talked about - just seeing him was enough for this obsessed fan; he is looking SO good. I do recall that the most of the audience seemed almost as enthusiastic as I was, especially the female B7 fans. Afterwards, Paul and Andrew Sewell discussed the proposed B7 film (see Judith's transcript of this) and I sat at the back trying to be inconspicuous (in Avon silver, ha!). We needed some dialogue for our sketch for Sunday night; being Londo Mollari comes naturally to Lesley now, but our young recruit Becky didn't know much about her character of Vir Cotto, so we wrote some lines for her. I was thankful that I had my usual silent part as Londo's lady and planned to be resplendent in sequinned purple - at that stage I had no intention of doing anything else in front of an audience. 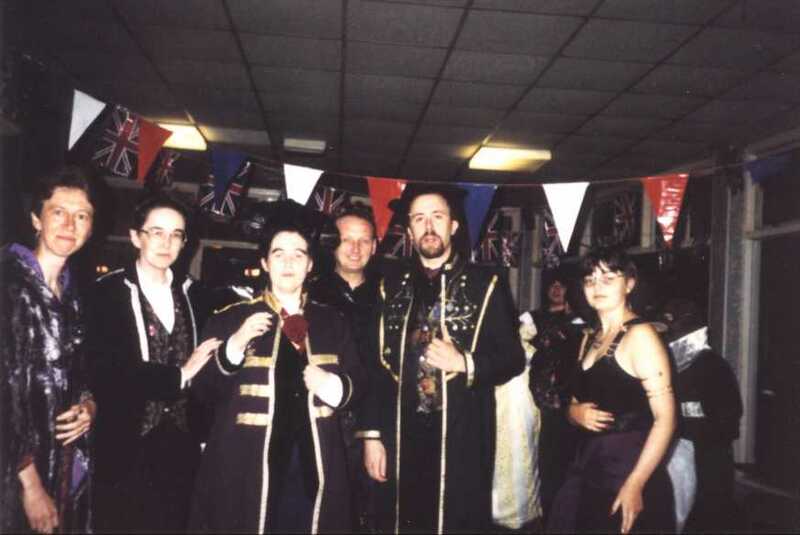 We found out that there was another group of Centauri also doing a sketch, the "League of the Non-Aligned" from London, with a rival Londo (male) and the Emperor Cartagia (female) and decided to check out "the opposition" later that evening, after the Cult TV Awards. I arrived late in the main hall for the Awards and missed the first few - most of the awards were presented to the winners by Paul Darrow and Michael Sheard (two shy, retiring gentlemen!). Then the award I'd been waiting for, Hall of Fame - Actor, and Michael announced the winner ...yes, it was Paul. He seemed surprised, but I just knew he was going to win, even against opposition like Roger Moore! The winner of Hall of Fame - Director was one of my childhood heroes, Patrick McGoohan, star of "Dangerman" and "The Prisoner". Paul read us his acceptance letter and there was a collective gasp from the hall when we heard that Mr McGoohan would (hopefully) be coming to CULT TV in 2000. The final, special, award for Lifetime Achievement went to a man without whom we would not have had all those wonderful action-adventure ITC shows of the 60's and 70's - the late Lew Grade. Lesley told me later that that she'd sought out the other "Londo Mollari" and they tried to out-drink each other; fairly evenly matched, so I think the result was a draw! Saturday night's disco theme was "70's", but as I wasn't feeling well, I didn't stay long enough to see if the DJ's choice of music was as bad as the night before. A pity though, as I heard reports the next day that Mr Darrow had made an appearance at the disco! I left my room-mate sleeping soundly as I went to an 8am viewing of "Merlin - The Magic Begins" featuring Gareth Thomas as Blaise. It's a show in the Hercules/Xena mould, tongue-in-cheek history/fantasy, with a gloriously hammy black-clad villain. It was scheduled for 8-9am, but was still running at 9.10 and breakfast finished at 9.30 - so I had to abandon Gareth in favour of my rumbling stomach! Most of our cast for the "F-5m" item gathered in the Dealers room, which had enough space for us to rehearse, plotting out stage positions on the floor with Redemption '01 leaflets. Our "Vir Cotto" was missing, so I took her place as we went through the sketch a few times and as I spoke Vir's lines to the intimidating Technomage (Judith), I realised that the part was meant for me - I am Vir! (yes, the words "Le...Londo, don't do it" just trip off my tongue). Afterwards I suggested to Becky that a pretty teenager was more fitted to play Londo's girlfriend than I was (I'm older and taller than Lesley/Londo!) and I think she was quite relieved to change characters. As my fancy purple dress was far too big for petite Becky, we gathered together a "Centauri dancer" outfit out of Xena's bodice, Londo's purple scarf, my black skirt and sequinned belt - a quite effective looking costume at short notice. Judith, Anne, Lesley, Steve, Lord Refa, Becky Sunday evening - an on-stage rehearsal, a hurried dinner, then Steve and I went to my chalet to turn him into a Centauri. I'd played hairdresser for "Lord Refa" earlier in the day, now there was just Steve and myself to transform. Lesley arrived in time to "help" me arrange my short hair into a Centauri crest. After almost asphyxiating me with hairspray, she forgot that she had a glass in her hand and tried to drown me in Jala (luckily, blue alcohol does wash out of white shirts!). The entrants for "F-5 Min" gathered backstage; our Centauri rivals, the League of the Non-Aligned; a Sontaran cookery expert (from Dr Who); a comedian and a new version of the Village People. We were on second, after the "Village People", and by now I was petrified - was I mad, volunteering for this? (answers on a postcard to Vir Cotto c/o Centauri Prime). Specs removed, I blindly walked out centre-stage, wringing my hands and mumbling Vir's lines. Everyone else performed perfectly; Londo and Lord Refa were magnificent, the Technomage was daunting, the Centauri dancer was beautiful, Lord Refa's aide (Steve) was convincing; Vir was shaking with nerves (not acting) and gulped down a shot of Jala as soon as she got off-stage. Our ordeal over, we sat back to watch the rest and I thought that the other Centauri act was bound to win. Transcription of the sketch What a shock when the results were announced in reverse order - they were Third, we came Second (Alex's Angels, the "Village People" won). Lesley and I tried very hard not to gloat, but failed miserably; 2 days from idea to performance and we came Second! - the others had been rehearsing for 2 weeks! We adjourned to the bar with the other Londo and Emperor Cartagia, and using a rather pointed knife provided by the barman, I (very carefully) re-enacted Vir's assassination of Cartagia - she looked a little worried when she saw the knife in my hand! The disco theme was "80's" and there was actually some appropriate music! Our favourite party-animal, Michael Sheard, was to be seen sharing the dancefloor with a Sontaran, a Cyberman, a couple of Centauri, Xena and Avon. It's a lot easier packing to go home, just throw everything in the case. Then check the drawers and find that we almost left Becky's Xena skirt! Lesley was still in costume and treated Micheal Sheard and everyone else gathered in Reception to the first public removal of Londo's crest. After wearing it continuously since Friday evening (yes, she sleeps in it) her hair was in dreadlocks - a Klingon or a Gorgon? The end of a fun weekend - I'd danced, drunk, won a raffle, met Paul Darrow again, worn strange costumes/hair, gone on stage (aargh) and we got 4 more members registered for "REDEMPTION '01". Did we enjoy our weekend in "sunny" Sand Bay - well, I think that we did, as Lesley and I both registered for CULT TV 2000. So if you're at CULT TV in Torquay next year, come to our room-party and sample some Centauri hospitality.